This rich hearty dressing is traditionally mixed with romaine or cos lettuce and topped with freshly grated Parmesan and croutons. Serve with anchovies, bacon or grilled chicken, steak or seafood. 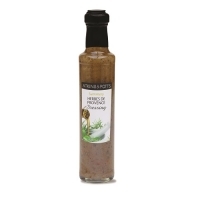 Enjoy this heady dressing – inspired by traditional recipes from the south of France – with sun-dried tomato salad or oven-baked artichokes, or drizzle over asparagus with fresh cracked pepper, or over roasting vegetables for added depth of flavour. 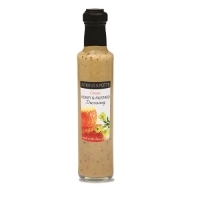 Enjoy the rich sweetness of honey combined with the subtle warmth of mustard over spinach or mixed green salad garnished with bacon, mandarin orange or bean sprouts. It’s also delicious drizzled over grilled tiger prawns and rocket salad. 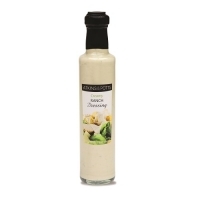 This incredibly versatile dressing can be drizzled over salads, grilled vegetables, barbecues, baked potatoes or burgers. Mix with Cajun spices to make a dip for tacos and tortillas. Enjoy the nutty mellowness of slow-roasted fresh garlic and the sharpness of balsamic vinegar with green salads and avocado or drizzle over oven-roasted sliced peppers, aubergines, courgettes or portobello mushrooms. 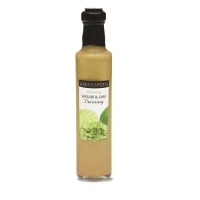 Enjoy the spicy warmth of wasabi and the citrus sharpness of lime drizzled over a seared tuna or beef salad with avocado. Also delicious served with grilled salmon.